Port of Alaska is Alaska’s premier cargo import terminal. Every year it handles more than 3.5 million tons of food, building materials, cars, clothing, cement, fuel and other goods that Alaskans need and use every day to live, work and thrive in our state. The Port is an intermodal transport hub that efficiently connects marine, highway, rail, pipeline and air cargo systems to move goods and fuel to some 200 communities, military bases and other destinations across our State. The Port of Alaska is Alaska’s economic heart. Almost half of the cargo crossing its docks is bound for destinations outside of Anchorage, from Homer to Prudhoe Bay. It serves deep-water vessels operating year round to transport cargo faster, cheaper and more reliably than any other means. It is a critical piece of U.S. national defense infrastructure that helps keep our nation strong . . . and Alaska produce fresh. Docks are maintained at a full seaway depth of 35 ft.
95 percent of all refined petroleum products distributed into Southcentral/Railbelt Alaska passes through the Port of Alaska valve yard, including virtually all AV gas consumed statewide, jet fuel used at Ted Stevens International Airport and Joint Base Elmendorf-Richardson and liquid fuels for motor vehicles, power utilities, home-heating, etc. 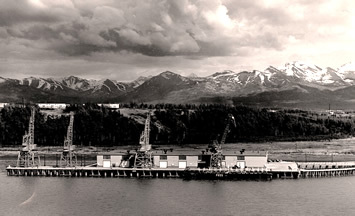 The Port of Alaska opened shortly after statehood in 1961 with capacity to serve the biggest ships in Alaska. It was the only deep-water port in Southcentral Alaska to survive the 1964 Good Friday Earthquake and resulting tsunamis. Today, after more than half a century of reliable service, the facility is suffering a slow-motion disaster from corrosion and age, and the docks are unlikely to survive another significant earthquake. 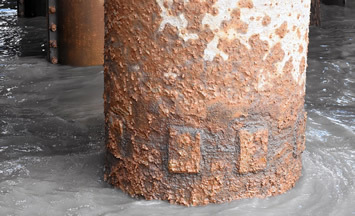 Engineering studies show that Port of Alaska docks are severely corroded and its wharf piles have been classified as being in poor condition since 2000. Anchorage currently spends more than $5 million annually to maintain operational capacity of existing wharf piles and other aging Port infrastructure, but this work does little to enhance the facility’s earthquake survivability. 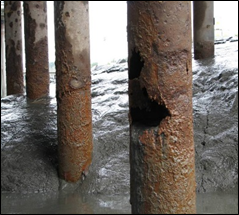 Anchorage spends $3 million to repair about 100 severely corroded wharf piles each year. 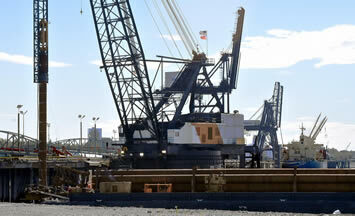 The port has a total of 1,423 wharf piles. This situation imperils Alaska’s economy because the State does not have cargo import capacity or infrastructure that could adequately substitute for the Port of Alaska if it is significantly damaged by an earthquake or other disaster. All other Southcentral Alaska deep-water ports combined do not have the cargo-import capacity to cost-effectively replace the Port of Alaska, and alternative transport modes have other challenges. Trucking goods to Anchorage from lower-48 suppliers, for example, can be as fast as ship transport but typically costs two or more times as much per pound, depending upon fuel prices and other factors. Barge transport can cost less than ship transport, but barges carry significantly less cargo and typically take ten days or more compared with three days by ship, and barge operations are highly weather dependent. Air transport is significantly faster than ship transport, but can cost four or more times as much and has severe size and weight limitations. And there are no lower-48 rail or pipeline options for importing goods into Alaska. The aging Port of Alaska docks are the single biggest hazard to Alaska’s import supply chain because they are a single point of failure and are (currently) unlikely to survive another major earthquake. Unlike the lower-48 states, Alaska does not have population density that economically supports redundant facilities or cargo-handling capacity to substitute for the Port of Alaska. Consequently, the most cost-effective way to safeguard Southcentral Alaska import capacity is to replace the Port of Alaska’s existing docks with modern facilities that are designed and constructed to survive a 1,000-year seismic event, which exceeds the 1964 earthquake. Key portions of the new fuel and cargo facilities will be designed to be operational within seven days of any anticipated earthquake so that the port could support regional disaster recovery efforts any time of the year. The Port of Alaska (POA) is a deep-water port located in Anchorage, Alaska with four bulk carrier berths and two petroleum berths. The POA is an enterprise department under the Municipality of Anchorage. As an enterprise, the Port is distinguished from other types of municipal departments, largely because it creates enough revenue to support its operations along with paying annual fees to the municipality. The Port Director is appointed by the Mayor and reports to the Municipal Manager. In many ways, despite its enterprise distinction, the Port acts as a standard municipal department with the Assembly approving the annual budget and with contract services, financial support and other day-to-day activities managed by the appropriate municipal department and subject to all municipal code. The Port is a “landlord” Port which means that we charge users for real estate and dock use and are responsible for maintenance, management and upkeep. The Port does not provide in-house stevedoring services. Customers calling on the Port are required to secure these services on their own or through a vessel agent.